Is it spring or are we still in winter!? March is a transition month here in Austin, TX. There are live oak trees still letting their red and yellow leaves fall, while ten feet away the Mountain Laurels are blooming with fragrant, purple flowers. Looking around at the landscape, one would think that October and April somehow managed to bump up against each other while the other months weren’t looking. You can see the confusion of seasons at the farmer’s market too. The first bell peppers are starting to arrive, folks are selling early tomato transplants, and yet, most of the produce available is the hearty winter kind. Like turnips. Bins upon bins of turnips. It’s hard enough to come up with interesting turnip recipes in the middle of winter, but when your senses are yearning for the bright, crisp flavors of spring, the humble turnip needs a lot of help. This salad pairs crisp green apples and thin turnip slices with a bright, flavorful vinaigrette. The trick for this salad is to let the vinaigrette ingredients start to make friends with each other while you prepare the other ingredients. By the time you’re ready to dress the greens, the salt, garlic, rosemary, and jam will have blended into a lovely concoction. The sliced vegetables and dressing could even be mixed in advance and stored in the refrigerator for a quick weekday lunch. Simply toss in some greens and you’re good to go! Make sure to check out Mollie’s blog, Parsley and Pumpkins, for more amazing veggie-centric creations! In a small container, combine all dressing ingredients except the oil. Set aside. With a mandolin or knife, slice the apple, fennel, and turnip into thin slices. If desired, cut the slices into smaller strips. Set aside. Taste the vinegar mix and adjust. You may want more salt or more jam depending on your preference. Whisk in olive oil. Taste again and adjust seasoning. In a large bowl, add lettuce and half of the dressing. Gently fold lettuce to coat with dressing. Once thoroughly mixed, add half of the sliced veggies and the remaining dressing. Fold again to incorporate. Add the remaining veggies and fold in again. 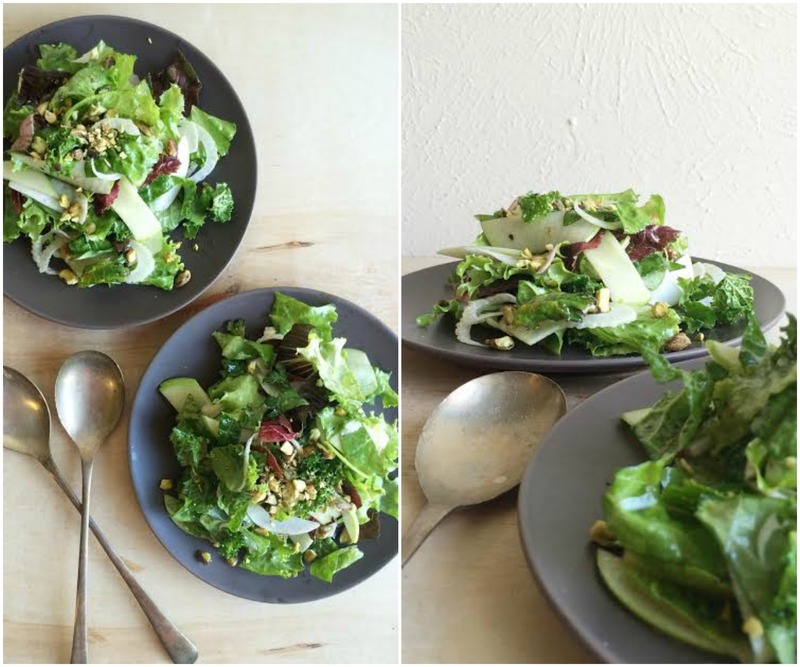 Top salad with pistachios and serve.